You may receive updates from PSC/CUNY, the sponsor of this petition. Our work at Queens College is underpaid and too often performed in conditions that undermine student success. The adjunct professors who teach the majority of courses at Queens College earn a near-poverty wage despite their PhDs or other advanced degrees. Salaries for our full-time faculty and staff lag thousands of dollars behind those at comparable institutions such as Rutgers and U. of Connecticut. This petition calls on President Félix V. Matos Rodríguez to publicly support fair adjunct faculty pay of $7000 per course and increased salaries for all CUNY faculty and staff. Just as important, the petition urges President Matos Rodríguez to push for a CUNY budget request that includes public funds to support our demands. The current collective bargaining agreement is not sufficiently funded by the State. Queens College and other CUNY senior colleges have been forced to cannibalize academic budgets to help cover the costs. We, the undersigned students, staff and faculty of Queens College, call on you to take a public position in support of a fair contract between the University and the Professional Staff Congress (PSC), a contract that includes a major increase in adjunct faculty pay. We stand united as full-time and part-time employees, staff and faculty, joined by students, in support of the PSC’s demands. Together, we support advances for all faculty and professional staff—and we stand behind the PSC’s breakthrough demand on adjunct faculty pay. Fair salaries for adjunct faculty would benefit all of us and would enhance the education CUNY offers its half-million students. Adjunct faculty are the majority of CUNY faculty. Queens College cannot thrive when the majority of the faculty is paid a near-poverty wage. Full-time salaries, moreover, are not competitive regionally or nationally. The new contract must increase salaries for all, including fair pay for adjunct faculty. An essential step toward adequately paying the majority of our faculty and fully funding the new contract is inclusion of a request for the necessary funding in the CUNY Budget Request for Fiscal Year 2020. We reject the claim that there is not enough money in the New York State and City budgets to fully fund a new PSC contract. It is time for state lawmakers to reverse the decades-long decline in the real-dollar value of faculty and staff salaries throughout CUNY and move toward real parity for adjunct faculty. The funding must not come from shortchanging any of our faculty and staff or from increased student tuition. Rather, it must come from new public investment. It is outrageous that colleges are routinely expected to cannibalize their academic budgets to pay for raises agreed to by the CUNY Board of Trustees. A fair rate for adjunct faculty is a minimum of $7,000 per three-credit course. According to the Economic Policy Institute, this amount would enable adjunct faculty who teach a full load to attain a modest but adequate standard of living in New York City. Yet starting pay for a CUNY adjunct lecturer is now a mere $3,222 per course—as low as $20,000 per year for someone who carries the equivalent of a full-time teaching load. That is not a livable wage in New York City, and it is far less than the adjunct faculty compensation at local colleges such as Fordham and at neighboring public university systems, such as Rutgers and University of Connecticut. As more and more universities in the city have recognized that high-quality education requires fairly paid faculty and staff, and as more and more CUNY adjunct faculty leave for better paid positions, CUNY presidents need to ask the state for the necessary funds to support a great university. We call on you to use your singular voice as our college president to stand up for our students and faculty. 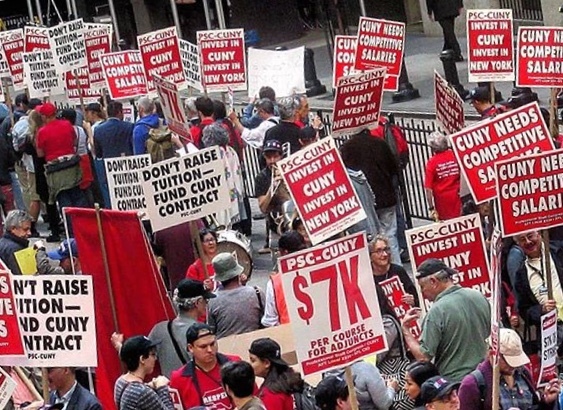 We urge you to press the Board of Trustees to include full funding for a fair PSC-CUNY contract and funding for fair wages for CUNY’s adjunct faculty in the University’s budget request.